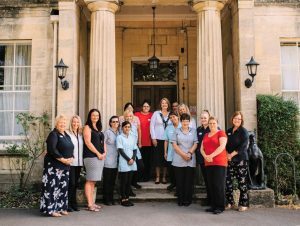 Our staff are what makes Watermoor House such a special place to live. They create a warm and welcoming home where our Residents receive the best in professional care whilst respecting their dignity and individual needs. All our staff are fully trained when they join us and a large proportion of staff have undergone dementia training. We strongly encourage staff development through undertaking other qualifications such as NVQ/CQF levels in Care. The home is run by a team of managers who are passionate about providing the very best support to residents and staff alike. Georgina has been at Watermoor since October 2014 and started in a role as a senior care officer. Following becoming deputy manager of our extra care unit, she went on to study Level 5 NVQ in Care. Helen joined Watermoor from a background in school business management and hotel marketing. Helen’s role is to work in partnership with the trustees, home manager and administrative staff to meet the business objectives of the home. Julie manages our senior team leaders who run our four teams of care staff, as well as overseeing our health and training coordinators. Julie has been with the Watermoor family for over 9 years and holds a Level 3 NVQ in Care. She takes great pride in providing dedicated care and a calm and peaceful environment for our residents. Karen has been with Watermoor House for 4 years and is responsible for managing the domestic team who make sure the house is always spotless, and for ensuring the high standard of laundry service for all our residents.